Suffixes are the letter/s which are added at the end of a stem to make new words. The affixes used in the suffixed words are different from the affixes used in the prefixed words, and they make different kinds of words. Most of the affixes that are used in the suffixed words have no meaning of their own. Reader = ‘read’ is the stem of the word which has different meaning and different grammatical function in a sentence but the affix ‘er’ changes both the meaning and the grammatical function of the word to make a new word. Note: It is not necessary that a suffix change both meaning and grammatical property of the words. It can perform either of them. A suffix can make a word/stem of a word a noun, verb, adverb, or adjective. 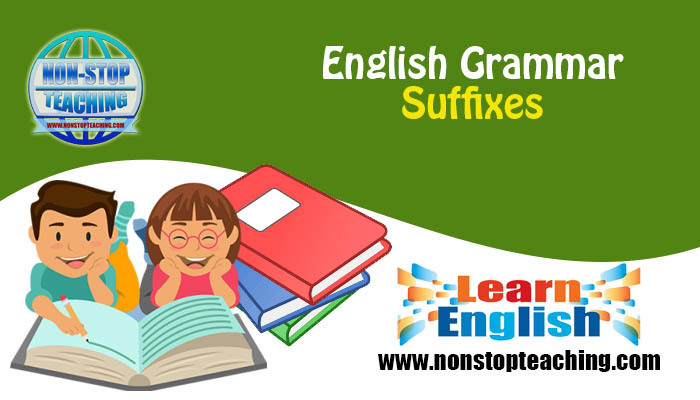 A suffix can also make a transition in the degree of an adjective or in the tense of a verb.